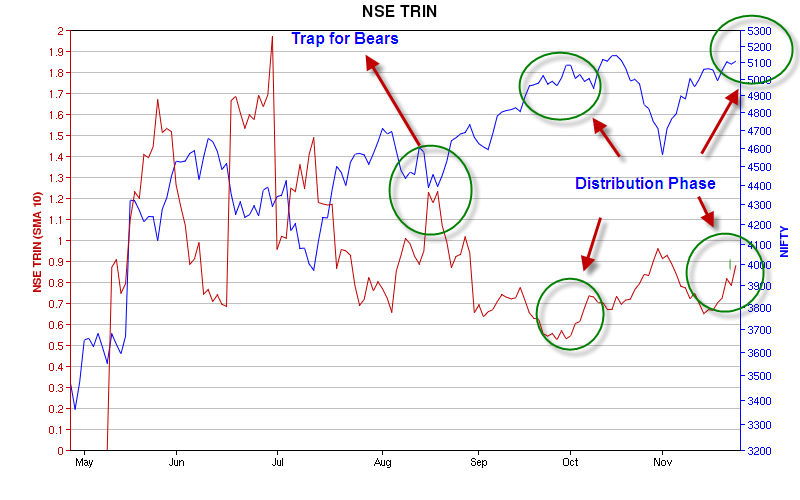 There is a interesting surge in trin towards 1 which denotes that we are in a distribution phase. Rising trin in a rising market indicates normally a distribution phase an indication of overbought levels. As the market is trending higher during a rising trin which in turn indicates that more volume is moving into declining stocks. Be cautious with longs as we are probably reaching the top in few trading session. dear rajgood explanation, till now i donot no much abt TRIN but you explanation have enlightned me. Could you givn me a ling which gives good understanding of TRIN.M.Sri MahidarTrend is Friend.